SEATTLE--(BUSINESS WIRE)--Glowforge©, the Seattle-based maker of the iconic 3D laser printer, is excited to announce the launch of its Proofgrade™ materials line. 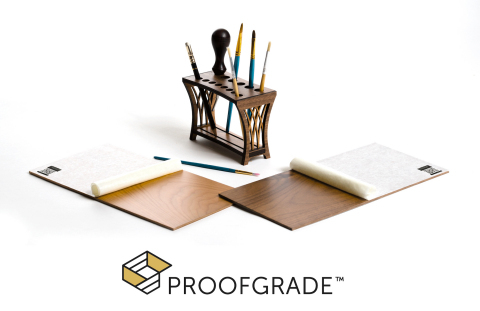 Proofgrade is the first line of materials that are sourced, encoded, and lab-tested for perfect printing, every time. They are specially formulated for the Glowforge 3D laser printer and work well with other cutter/engravers using CO2 laser technology. Current offerings include custom hardwoods, plywoods, veneer, acrylic, and leather, each manufactured especially for the Proofgrade line. The launch follows the industry-staggering introduction of the Glowforge 3D laser printer. In 2015, Glowforge set the record for the largest 30-day crowdfunding campaign in history with $27.9 million in pre-orders - a record it still holds today. Now, two years later and after more than $70,000,000 of product sales, thousands of the pre-ordered printers are being delivered to delighted customers. “I am deeply impressed with the fact that with zero prior laser experience I was immediately able to start cutting my own designs,” said Seattle-based graphic designer Daria Penta. Glowforge’s success has been in part because industrial laser cutter/engraver technology has always been too expensive and complicated for consumers to use. And a big part of that complication is choosing the right materials. Glowforge 3D laser printers are currently available on Glowforge.com, and Glowforge owners can purchase Proofgrade materials at Proofgrade.com. Glowforge is a Seattle-based startup that makes a 3D laser printer. Glowforge's wireless desktop laser makes it simple for designers, artists, and makers to take products directly from digital design to reality. Unlike 3D printers that build objects out of plastic, Glowforge uses lasers to print products out of durable and beautiful materials like wood, leather, acrylic, paper and fabric. A sleek and efficient design makes this industrial-grade technology beautiful and affordable, and a friendly cloud-based app makes it easy to create amazing things with Glowforge. For more information, please visit https://glowforge.com/.